The review below, this one another positive one, was posted on the Innsmouth Free Press website and written by Silvia Moreno-Garcia – also, be sure to look out for an interview with your erstwhile publisher in the virtual pages of the very same Free Press, to be published very soon! It’s funny how life works out. I was thinking of requesting a review copy of this title and the publisher e-mailed to see if I wanted it. Are my nascent telepathic abilities increasing? 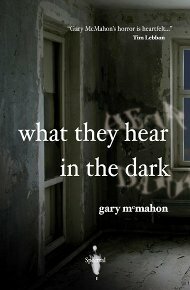 What They Hear in the Dark is a limited-edition, signed chapbook published by Spectral Press. This strikes me as smart. With people complaining that e-books are going to eat print books alive, creating collectible chapbooks seems like an effective strategy for continuing to offer print products. Add to that the fact that it is a chapbook – which means us modern, hard-pressed-for-time folks can sample it without giving up days of our lives – and you’ve got a very good concept. Anyway, the chapbook in question is a modern Gothic story, with a grieving couple busy remodeling a house and discovering a mysterious room that seems to muffle all sounds. And the husband feels there is something terrible living inside The Quiet Room. I was incredibly excited to read this tale after looking at the blurb, but I think my excitement might have damped the final enjoyment. I thought it could have been a tad longer. I also kept thinking about “Don’t Look Now” and its parents trying to survive after the death of a child, and encountering the supernatural, basically the same central concept as this chapbook. This may not be the writer’s fault as much as my own, as I read the Du Maurier story not so long ago. This minor nitpicking aside, it’s a good story. I enjoyed the sympathetic protagonists. What? A horror tale with people you like? Nooooo. This, after reading an anthology with a bunch of awful, irritating characters, came as a blessing. The prose is nice and the house, with its very special room, is creepy, so overall, it gets a thumbs-up. I’ll leave it at that, as I don’t want to give away the ending, or any more details. I read a lot of short fiction and anthologies because I don’t want to spend much time or effort on novels (especially series, ugh). Chapbooks like this are perfect for me and I hope Spectral Press will continue its line with similar offerings.